01-06-2011, Ho Chi Minh City. Upon arrival in Ho Chin Minh City we headed straight for a recommended travel agency specializing in trips to the Mekong Delta. We voiced our wish to rent a small plane. The clerk fell silent in mid sentence. “You know this is a communist country. They make everything difficult,” he replied. “I don’t think it is possible.” After some pushing him, he advised us to call the airport authority which I did from his phone. The operator forwarded me directly to the right person who unfortunately didn’t speak much English. So after I gave the phone to the travel agent I got the message that I should send an email or go to the airport myself. The agent still kept shaking his head with a slightly amused (or was it pitying?) look in his eyes. He repeated: “You know this is a communist country? You have to get permission for everything. It is going to take a lot of time… This is not like your country.” I explained I had surprisingly good results in other countries paying around 250-300$ per hour for a small plane. He grinned again and said, “Well it will be at least ten times more here!” I decided not to reply to this obvious exaggeration. We decided to have lunch and I sent an email to the Airport Authority, not expecting a reply. Keeping a shuttle in the air. 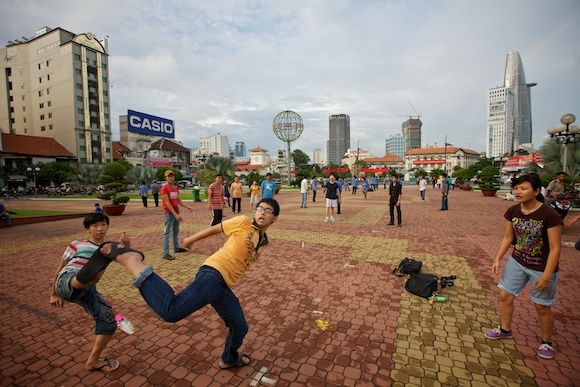 Large groups of Saigonese play a type of hacky sack in the 23/9 park in central Ho Chin Minh City. During our walk back to the hotel we passed by a large fancy looking travel agency, with loads of counters for domestic flights. We decided to try it once more. The first host that approached us looked a little puzzled after my question but pointed us to a desk. A little discouraged we arrived in our hotel where I checked my mail. I found a reply in my inbox from miss Kim of the Airport with a friendly reply when I would like to rent a plane. Ha! I thought, you see? it is possible! Cost: first 2 hours 12.000 USD and 5.500 USD for each consecutive hour. Ouch. Miss Kim is looking forward to hearing from me. Sure, she is. But I’m not sure… Am I supposed to bargain with her, like you do over everything in Vietnam? Then where do I start? Usually you are supposed to end up at about half the price you are quoted. That would still leave us at the rate the travel agent predicted: 10 times the price I’m used to. No way I’m going to do that. So more internet research. I found a parachute club in town. They offer parachute courses with a jump from a helicopter for 100 USD. But supposedly only for locals. Of course no email address or Telephone number. But a street address. So We’ll just go there in person tomorrow. And we may visit the airport as well, following up on the posting about ‘air walks’ that started this quest at the first place. The hunt for a small Airplane, Part 2.